Vanna K's Solea Collection offers engagement rings with unsurpassed quality, refinement and amazing attention to detail. Look at this new, stunning addition to the collection! This ornate diamond engagement ring offers unique styling and details. topped with an abundance of luminosity. The platinum metal is shaped to form waving clusters of diamonds, using a full 1.25 carats of micro-paved brilliant white diamonds which sparkle from every angle! 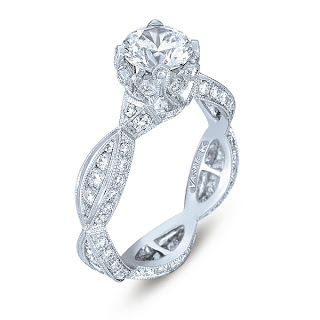 The design is topped off with the 1 carat center stone, set with ornate crown prongs. This ring is classic Vanna K styling and will wow the lucky woman who receives it! Find this and other luminous diamond engagement rings today at Vanna K.